Bliston Hotel offers a luxurious and tranquil retreat in Bangkok, a 3-minute walk from Chidlom Skytrain Station. It provides spa treatments, an outdoor pool and a restaurant offering foie gras. 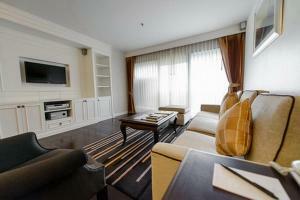 Bliston Suwan Park View hotel is a 30-minute drive from Suvarnabhumi International Airport. Popular shopping areas like Central World Plaza and the Pratunam Wholesale Market are about 1 km away. Spacious with wooden flooring, the air-conditioned apartments offer ample seating area. They have well-equipped kitchens and modern home entertainment systems with cable TV. Bathrooms come with a bathtub. Relaxation options at the Bliston Suwan Hotel include a rooftop swimming pool surrounded by sun loungers and a steam bath. The fitness centre provides professional trainers to assist guests. Spa@Tonson specialises in Thai massage. Offering a fine dining experience, Artur Restaurant features prime steaks, as well as, fresh seafood. The restaurant is well-known for its Caesar salad and extensive martini menu. 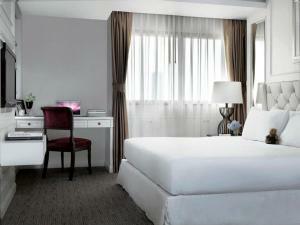 The hotel offers room service, babysitting and laundry services. Car rentals are also provided for added convenience. Please note that the renovation works will be taking place at the property's 14th floor from 1 June 2018 until 30 November 2018. The works will be conducted between 09:00 and 17:00 hrs., only on weekdays. The property will endeavor to keep the noise level to the minimum. Guests are required to show a photo identification and credit card upon check-in. Please note that all Special Requests are subject to availability and additional charges may apply. Apartment features a separate seating area and views of the city. 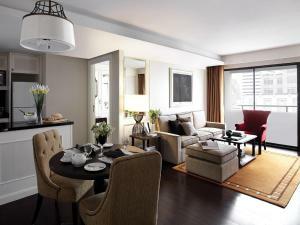 Rate: THB 3190.00 ... THB 7933.33; select dates below to get current rates. A large apartment with a separate seating area and views of the garden. This room offers a kitchen, a seating area and ironing facilities. En suite bathroom comes with a bathtub. There is a private balcony in this room. 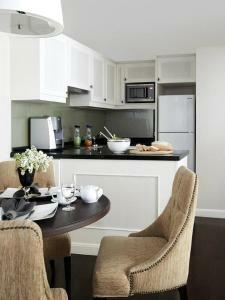 Spacious suite features a fully-equipped kitchen and kitchenware. The living room offers a home theatre system with surround sound and a satellite TV. The master bedroom also has a satellite TV. Both bedrooms have their own en suite bathroom. 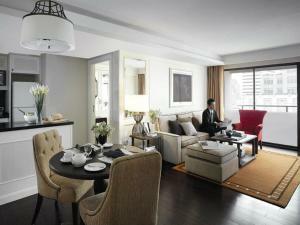 suite comes with a separate living area and a fully-equipped kitchen. The master bedroom offers a satellite TV, a bathtub and separate shower facilities. A satellite TV, a home theatre system with surround sound are included in the living area. Other amenities include a hairdryer, a washing machine and an electronic safe. A spacious suite comes with a separate living area and a fully-equipped kitchen. The master bedroom has a satellite TV and an en suite bathroom. The guest bedrooms both have an en suite bathroom. A satellite TV, a home theatre system with surround sound are included in the living area. Other amenities include a hairdryer, a washing machine and an electronic safe. 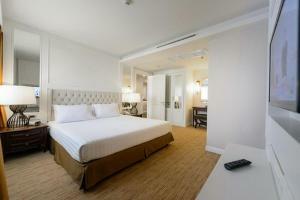 This suite features air conditioning, sofa and cable TV.